A week of activities, organized Under the High Patronage of the President of the Italian Republic, and in partnership with educational and cultural organizations, will celebrate Italian excellence in language, arts and entrepreneurship. 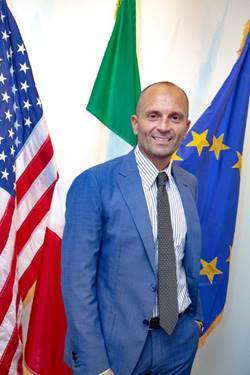 The Office of the Italian Consulate in Miami, under the leadership of the honorable Consul General, Cristiano Musillo, who started his tour of duty last August, has announced that a week-long celebration, the 18th International Week of the Italian Language, will take place in various Florida cities from October 15 until October 22, 2018 during the statewide Italian Heritage Month celebration. The week pivots around an educational initiative called NETWORKshops, whose activities are being planned with the support of ODLI, a Florida-based nonprofit organization that raises funds for Italian language education throughout the state. This is a project that showcases Italian excellence in language, visual arts and business and involves Italian artists who excel in various artistic mediums teaching and collaborating with high school and University students of Italian -- from Carver Elementary school, Carver Middle school, Ponce de Leon Middle School, Metropolitan International School, iMater Charter Middle/High School, International Studies Charter School, International Studies Preparatory Academy, Palmetto Senior High School, Gaither High School, Somerset Academy Middle/High School, Florida International University, University of South Florida - in lab workshops. It also speaks more broadly to exciting collaborative opportunities and synergies that exist within the network of Italians that live in Florida and Italy to more broadly promote the Italian language and culture beyond just the Italian community. The artists include Diego Santanelli, a painter who works with natural enamels; Paola Cassola, an installation artist; Marina Fonteyne, a photographer and Enrico Ostuni, a video storyteller. In addition, a young Italian entrepreneur, Matteo Achilli, led a workshop on the development of startup projects in Italy that involve new technologies. This workshop project will be showcased during an exhibit at the University of Miami’s Korach Gallery. The opening reception for this exhibit on October 15 also marks the launch of the Italian Language Week. Expanding on the network concept, the Consul and ODLI have organized additional activities in collaboration with Dante Alighieri Society, Marangoni Institute of Miami and the Italian Studies Programs at Florida International University and Florida Atlantic University. The week-long events will culminate and conclude on October 19th with a roundtable discussion, "When I.T. makes the difference. Italian and new Technologies " at the University of Miami. Representatives from various educational, cultural, artistic, scientific and business sectors will discuss how emerging technologies quickly connect individuals and organizations and create synergetic relationships and projects within and beyond the Italian network. The schedule for the week is as follows. Credentialed members of the media are welcome at all events, but please contact Jenifer Mangione at 561.961.9136 or jenifer@jmvmediagroup.com to confirm and coordinate video and photography. ODLI is a nonprofit organization founded in 2012 to promote the Italian language in the United States. The organization does this with the support of and in partnership with the 450.3676 government of Italy. ODLI's primary thrust is to bring Italian language education into the Florida school system by funding teaching posts. More information about ODLI can be obtained by calling 786.603.2400 or 305.or by emailodliinc@hotmail.com. The Italian Ministry of Foreign Affairs and International Cooperation has established the pillars for a new strategy for an integrated promotion of Italy around the world developing synergy between economic, cultural and scientific diplomacy and consular network and Italian Institutes of Culture. The main pillars are: 1.) Design 2.) Archeology and protection of cultural heritage 3.) Contemporary art around the world 4.) Italian language 6.) Invest your talent in Italy 7.) Fine Italian cookery around the world 8.) Cultural tourism 9.) Cultural and creative industries: cinema, audiovisuals and publishing 10.) Mediterranean 11.) Promotion of Italian science and research 11.) Integrated systems missions.